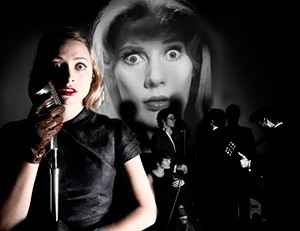 As part of the Nelson Arts Festival, last night at Nelson’s Theatre Royale we saw a live treatment (complete with band, actors and foley artist) of the 1962 B-movie horror classic, Carnival of Souls. It was remarkably good. I saw the original film quite a few years ago and was struck by how well made it is; despite the slow pace and the predictable plot (especially for modern audiences), the direction and cinematography have given the film cult classic status, influencing directors such as Lynch and Romero. Made on a shoestring budget in three weeks and ignored at the time of release, it’s a great shame the director Herk Harvey never made another feature. This presentation took the film to whole new heights, with a clever new score by Leon Radojkovic performed live by an excellent band, and four accomplished actors playing all the roles. Chelsie Preston Crayford, who voiced Mary (the stunning Candance Hilligoss) was particularly excellent. Gareth Van Niekerk pulled off foley (sound effects) duties from his solitary booth at the side of the stage, covering everything from footsteps to jangling keys to gurgling water. I was particularly impressed by the way the original script wasn’t changed and the actors didn’t ham it up too much, beyond a few extra “hmmmms” and some exaggerated accents. It struck a good balance between being entertaining, sometimes funny, and yet largely preserving the original integrity of the film—even increasing the mild scares of some scenes with some well-timed musical stabs and creepy organ themes. A fantastic night out in Nelson, enhanced by the stress-free pleasure of easy parking close to the venue, something we Sydney escapees still find a joy. You can get a taste of the performance here. This Sydney Theatre Company production , directed by Benedict Andrews, has been receiving good reviews, so we went along to see it last Friday night. While there were some interesting ideas, on the whole I found the production unfocused and trying too hard to be clever. As is often the case, the director forgot to concentrate on the beauty and impact of the words in the race to stamp distinctiveness on his interpretation. This was most obvious in the second act, where an already long play was slowed down to a brutal pace that, for me, leached the impact out of the performances. It’s often difficult to smoothly tear props up and down during a performance, but when Cassius (a greasy Frank Whitten) spent several minutes moving two tables and stacking chairs, surely even the most attentive theatre patron got sick of any possible metaphor and stifled a yawn. Despite the choppy pace, the performances themselves were good. The authentically patrician Arthur Dignam gave Caesar the tattered dignity of an old Broadway queen (an impression reinforced by the casting, in an unnecessary nod to Elizabethan tradition, of a young man as his wife Calpurnia). Ben Mendelsohn began powerfully when cradling Caesar’s corpse, though I found his forum speech lacking in impact. Robert Menzies as Brutus took an odd approach by playing him as almost annoyingly indecisive and seemingly hungover; affectations that reduced the tragically noble character to seeming senility by the time he turned the knife on himself. Many of the players took multiple roles to usually successful effect, but Lucius, here played by a young girl (Maddi Newling) was a continual witness in every scene, a trick that became annoying and overused. In fact, most of the characters, alive or dead, spend large amounts of time being mute witnesses to the events of the play, which perhaps reinforces the concept of us all being witnesses to the political and personal tragedies that surround us. In one example, though I missed the visual reference at the time, during one speech a voiceless actor climbed onto a box with a bag over his head in an echo of the Iraqi torture victim photos. Some of the staging smacked of conceit to me—the punishing slow strobe light in one scene, the over-the-top sequences where the mob was portrayed as insane clowns, and the occasional, unnecessary, nod and a wink to the audience. Apart from the strobe sequence however, the lighting and sound were very powerful. There was a feeling of trying to pack too much into this production. Shakespeare said it best—and sometimes, as here, theatrical trickery can serve to distract from, rather than reinforce, his words. Two and a half ears out of five. A lot of people around my age grew up with The Goodies. For those of you who missed out, they’re a trio of comedians—Grahame Garden, Tim Brooke-Taylor and Bill Oddie—who were part of the Cambridge University Footlights theatre of the sixties that also nourished the careers of John Cleese, Graham Chapman and Peter Cook. I’m not that long in the tooth, but every afternoon as I was growing up in the late seventies/early eighties, just before Dr Who, The Goodies was essential TV viewing. The opening strains of “The Goodies, goody-goody yum-yum” meant a brilliant half hour of surreal, slapstick fun. It’s because The Goodies was replayed so many times on afternoon TV that they are so hugely popular in Australia—apparently far more so than in England, where the show was played at a late timeslot. And Saturday night at the State Theatre you could certainly ‘feel the love’, as The Goodies took the stage to share some memories from those years, play a few clips from the show, and give us some insights into the making of the series. I and my friends hardly stopped laughing the entire evening, but then all Grahame Garden had to do was stand in front of a cardboard box on a table and mention the words ‘vampire bat’ for us to start laughing our heads off. Garden, in particular, still has that incredible comic timing that makes the simplest joke hilarious. The evening was lightly structured around the three taking turns reading out questions they’d received from their fans about the show, which was as good a framework as any for a chaotic, fun grab-bag of memories and sketches, including a reading from the old pre-Goodies I’m Sorry I’ll Read That Again radio-play days. I would have left out the ‘encore’ lip-synching performance of Funky Gibbon, which I never thought was very funny or Goodies-like, but then it was their ‘hit song’ after all. Four giant kittens out of five. PS. I went to buy the just-released second DVD compilation the other day and was disgusted to see that HMV were charging $50, double the price of the first DVD. This smacks of greedy opportunism—I for one won’t be buying until it comes down to the right price.